Add the mango puree and mix well and allow it to cool. Once cooled pour it in the ice cream mould or jelly mould and freeze to 4-6 hours. If ice crystal are formed mix well and again freeze it. 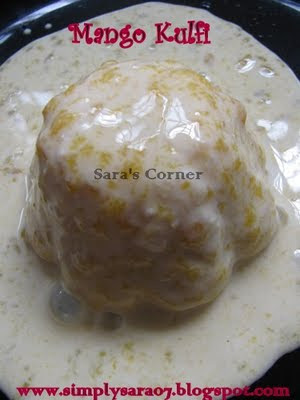 Enjoy Mango Kulfi, its very refreshing. Notes - I prepared it at nite and served next day afternoon. Too much freezing also forms ice. So just freeze it to 4-6 hours and Serve. This recipe is going to Celebrate Sweets Icecream by Reshmi and Nivedita and to Healing Foods Mango by Revathi and Siri. Tempting & perfect for the summer!! Kulfi... that too mango.. Yumm yumm!! Very tempting..would love to have 2-3 scoops of this wonderful kulfi. wow so tempting and delicious kulfi ! !